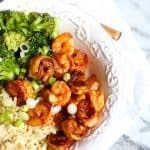 Easy Honey Sriracha Shrimp combines a sweet and spicy marinade with tender shrimp. Eat it plain or serve it over rice and your favorite vegetables. Peel and devein shrimp. Place in plastic bag or container for marinating. Combine honey, Sriracha sauce, and rice wine vinegar. Pour over shrimp and refrigerate. Marinate shrimp for an hour or up to 24 hours. Heat indoor grill pan. Drizzle with olive oil, and lay shrimp on pan. Turn shrimp when it turns pink on one side, approximately two minutes. Grill for another two minutes, or until cooked through. Serve shrimp over brown rice and/or veggies. Sprinkle with diced green onions.